The job of a drum technician is very demanding. During a festival, there may be as many as six or seven drum kits to tune and maintain on a daily basis, plus any emergency repairs or issues that may crop up over the weekend. Not only that, but the job also requires me to be at the main stage during sound check to liaise with the drummers from different bands, to determine their individual configuration requirements and assist them with their setup. During the performance, I then help to change drum kits quickly and accurately between bands, usually within a ten-minute timeframe. This role also requires me to occasionally make on-the-spot repairs or adjustments during performance. Dealing with top-level bands also requires me to frequently replace drum heads and accurately tune drums, something that I have gained vast experience in over 25 years of playing and performing. Contact me if you need a competent, focused drum tech for your next festival. 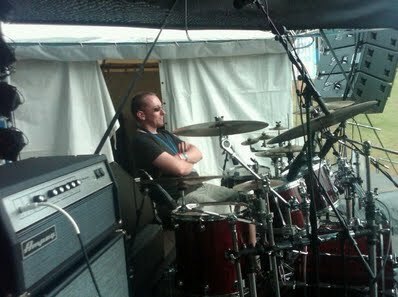 Contact me if you are after an experienced, competent drum tech for your next festival. This is where I bring my experience to you! Whether it’s your first drum kit or tenth, I can assist you in achieving the optimum setup, and help you to tune the drums to their absolute best. I’ll also provide you with tips on how to keep your equipment in good condition, so you can get the most out of your investment. Contact me if you need help to make your babies sound great. 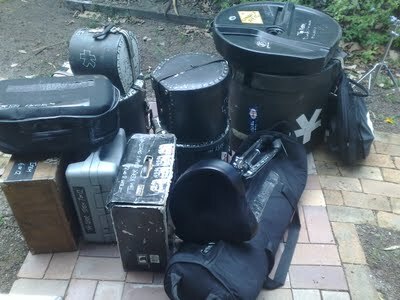 I have supplied drum kits for hire to different studios around the Sunshine Coast. Whether you’re after a basic drum kit, or all the bells and whistles, I can help. Check out my gear list, and contact me for more information.